Lily bulb (Baihe, 百合 in Chinese) is the rootstalk of lily flower. 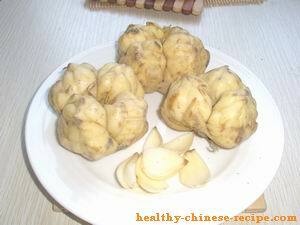 It’s Chinese medicine but often seen in Chinese dishes such as Stir Fried Celery with Lily Bulb, Mung Bean with Lily Bulb Congee, etc. 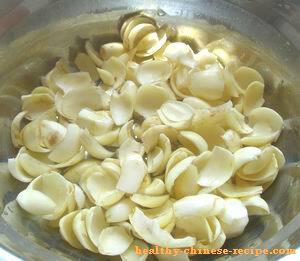 Lily bulb consists of thin layers, looks like garlic. It’s crispy in raw but tasted like mashed potato after long time cooked. There are two kinds of Lily bulb in flavor; one is a little bitter while anothr is a little sweet. Both can moisten the lung and calm the nerve. But the bitter one is better for clearing away heat. clear away heart fire to soothe the nerves. It can be used to treat the following diseases or as an assistant treatment. Modern research shows that lily bulb can moisten the lung, relieve cough, tranquilize the nerve, and have anti-cancer effect.